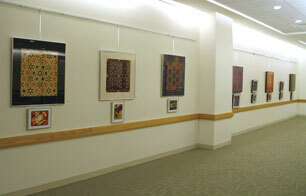 From March 6 to May 26, 2006 my work was on display at Dartmouth-Hitchcock Medical Center in Lebanon, NH (USA). 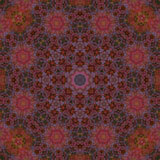 This was the first time I was able to show so many patterns in a size which displays them to best advantage. Simple patterns work quite well in small sizes, but the complex ones turn into pure geometry if they're made too small -- they lose the organic quality that is much of their charm. The 85 feet of corridor space, with good lighting and plenty of room to step back, gave room for a mix of small (12" wide) and large (up to 30" wide) patterns without being crowded. I like to display this art in an institutional setting, because it seems to me a perfect place for work that is beautiful, intriguing, and accessible to most people. See Some Thoughts on the Art for a discussion of people's reactions. I think it would be great in a waiting room or reception area to occupy attention while people wait. 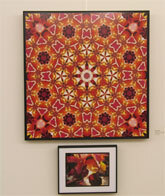 In the exhibit, each framed pattern was accompanied by the source photograph, in a matching frame. Source photos were 7.5"x10", matted and framed to 11"x14". The patterns were of varying sizes. The ones up to 22" wide were matted and framed under glass. The largest patterns were mounted to a backboard and laminated with a low-reflection covering to protect them, without the weight of glass. All pieces from the exhibit are still available or can be reprinted. Contact me if you would like to purchase them. More recent work is available at ImageKind, an online art source that provides high quality printing and framing. The images around this page are links to pages showing some of the works in the exhibit in more detail. The prices mentioned were those charged during the exhibit. In most cases these are available for lower prices now. Please contact me if you are interested. The full list of prices during the show is here. 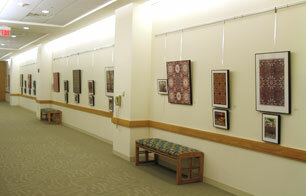 My thanks to Dartmouth-Hitchcock Medical Center for the use of this excellent display space. I thoroughly enjoyed meeting and speaking with so many patients and staff.